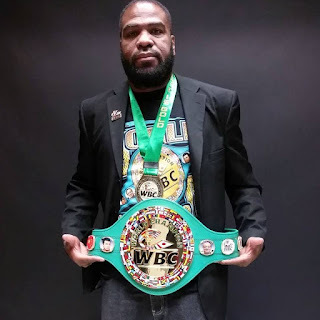 Honorary WBC World Champion David “Dino” Wells Jr.
Honorary WBC World Champion, Dino Wells Jr., star of the award-winning documentary “When the Bell Rings” is a force to be reckoned with when it comes to the entertainment industry. Over the years, the professional boxer, screenwriter and actor has partaken in many TV shows, feature films, commercials and videos. He has also been a stuntman on Chicago Fire and Empire, just to name several. Recently, Dino Wells Jr., landed his first leading speaking role in the film “Same Kind of Difference as Me” alongside many Oscar winning actors. Here is what he has to share during a recent interview with Consciousness Magazine. Aaron Robinson: What inspired you to want to become a boxer? Dino Wells Jr.: When I was 5 years old, my mom dated this gentleman who gave me some boxing gloves autographed by Sugar Ray Robinson. He use to work with me with the boxing gloves and I guess he wanted me to be a boxer. That never panned out. My mom’s broke up with him and I never seen him again, but I still had his gloves. All up until my mid teens, I use to watch boxing but my mom didn’t want me to do any physical sports; she just wanted me to play baseball. I was always interested in watching Sugar Ray Robinson’s videos. He passed away when I was 19, I will always pay homage to his career. When I left my moms home, I got into boxing. Aaron: Regarding your career, you are a honorary WBC World Champion. What was one of the most challenging factors or obstacles that you had to overcome to achieved this accomplishment? Dino: By me turning pro at 42 years old was a challenge within itself being that I was away from boxing after 15 years. It was also a challenge within itself listening to the naysayers. I just kept pushing myself. Once we finished filming this documentary “When the Bell Rings” and going through the whole process of that, I looked at the whole thing and felt like wow! The WBC, the World Boxing Council saw the documentary as it premiered in LA and honored me to be an honorary WBC World Champion. I felt a little empty because I wanted to earn it in the ring. At the same time, it felt good. Aaron: Speaking of “When the Bell Rings”, you are the star of the award-winning documentary. How did this film come into existence? Dino: Well, when I stepped away from boxing in 1996 and I didn’t make the Olympic trial I was kind of burned out by boxing. I looked at boxing in 2007 when Mayweather beat up Ricky Hatton. I was like wow, he’s still fighting! I didn’t get back into it until I was at the lowest of the lowest in my life living in California at a hotel, getting unemployment, jobs were scarce and I was in and out of relationships with women. I needed a drive and I ended up working as the production assistant at the Independent Spirit Awards. I was big and out of shape. I met the director Brad Bores. I told him my stories about me being a boxer back in the day and that I wanted to get back into it. Brad was like, “You use to box”! I told him my story because I wanted to do this documentary back in the day and people didn’t take me serious. I tried to peak his interest. Once he dug into my life story and started doing his own research to validate who I am, he said, “Hey look man, I want to film your story”. I found a gym. He filmed for almost two years - the whole process of me getting back into shape, getting back into the boxing state, getting beat up in the ring and all that [laugh]. Aaron: Are you still boxing or are you just working in the boxing arena? Dino: I have a boxing team right now. The Lethal Warrior's Boxing Team. The team consists of my son Deshaun Wells, he’s 15; Latrell Tillis, he’s the captain of the boxing team, he’s 13; and Anthony Adams Jr. who’s my southpaw, he’s 11. I took them through an 8 week basic training - testing their will, their heart, their soul, and desire for this sport. I filmed it every day and put it on my YouTube so that people can know the process from beginning to ending. Aaron: You are also an actor and screenwriter. Was this something that you always wanted to pursue? Dino: Acting is a passion of mines. My thing was to win a gold medal, turn pro in 1996, win a couple of belts, defend my belt and retire at the top of my game and use those accolades to get into acting, but it didn’t turn out quite that way. I took the hard knocks road into the film business. I’ve been in the film business off and on for about 20 years. I have a supporting role in a film called “Same Kind of Difference as Me” that is to be released in 2017. It’s a faith based film. It stars Renee Zellweger, Jon Voight, Djimon Housou and Greg Kinnear. Working with them has been great. I had another role on a TV show called Dead Line with Tamara Hall. I played a killer by the name of David. Acting is my passion, but my main goal is writing and directing. I’m writing a feature film and a pilot right now called “No Words at All” that I’m working on. It’s a serious piece about racism, injustice, cop killing and those things that are going on today. I wrote it when Mike Brown was murdered. And when my son got murdered last year on August 23rd, I started rewriting it. Aaron: Do you have any advice or words of encouragement for aspiring boxers or actors who are looking to be successful in their career or endeavors? Dino: For boxers, I would say that you have to put your all into it. You have to understand the sport and learn the sport. Work with the basics first and find someone that’s going to train and teach you. Don’t let anyone astray you off your path. As far as acting, do what you have to do. Do your due diligence, stay on your path and don’t let anything deter you from your path of getting that role. Don’t get discouraged when you go into a casting call and you don’t get a call back. Keep honing in on your skills. Go to your acting and audition classes. Keep pushing forth for your dreams and have the right people in your corner. Aaron: A lot of people today say the youth are not focused and so forth. What is your thoughts regarding this? Dino: When it comes to boxing it’s all about your circumstance and situation that you are in right now. When you think of a lot of successful boxers - they come from a demented background, a terrible upbringing. Not saying you have to have a terrible upbringing to be a boxer, but it’s about your mentality and upbringing. My son, he’s fighting because he wants to box. I’m not making him box. He has a pretty good living situation. My other fighter that I have, he has some issues with his life and he’s overcoming that. Instead of playing video games and sitting in front of a TV all day, I likes that he like to get in shape, run and do what he has to do with boxing. My youngest fighter, he has a lot of issues going on in his life, but at the same time, he’s taking those distractions and negative’s and is putting them into a positive, which is in his training. I had an interesting upbringing, my father wasn’t there, and my mom was very strict. When I got into boxing I couldn’t put 100 percent in it. That’s why my record is 67-13 as an amateur. I’m a great boxer, you know. I instill values into my boys. Some kids don’t have it. They get in it because their friends are in it. They would rather play their video games and be on their cell phones all day text messaging and being on WorldStarHipHop, YouTube, watching videos and being a couch potato. However, there are some kids that want to do something constructive all day. Boxing did save my life. I did run the streets in Chicago. I was a gang banger; I did the selling drug thing. I did all that negativity at one point, but boxing can save another kid’s life. Boxing is not just a gladiator sport; it teaches these kids the value of life if it’s done correctly. That’s what I love to teach my boys because I am exited about this sport. Aaron: You are also big on giving back to the community, where did that passion and love come from? Dino: Us as black people, there’s not a lot of positive images of us that’s out there that’s doing good things for the community. With the mainstream media today and how they look on us as people, it kind of jacked us; especially misrepresentation of black women in reality shows and the black men in general. These kids are coming up looking at these shows and they can miss how it is to be in society. My old neighborhood in Chicago, the West Pullman that use to be a prominent area on the Southside of Chicago, is like a desolate land. Businesses are closed, houses are being boarded up and there is gang violence. I feel as if I can be one positive seed in the neighborhood. I’m trying to open up a gym on the Southside of Chicago to give the kids something to look forward to. Rebellious Boxing USA from Australia is helping with opening the gym. I’m just very passionate about lifting us up as a people. I think that we are regressing and I think that we should be progressing. Dino: I’m doing a series which is called Hoodview Mirrow: Misunderstanding of Dino Wells which is my autobiography. You can catch that on my YouTube. The Misunderstanding of Dino Wells is my whole life story. I just want to encourage everyone to be focused, go through your goals and don’t let anything turn you away. If you have a religion and believe in that, stay faithful. Stay focused and just do your thing. aquila entertainment is currently scouting for music tracks and artists for the soundtrack for an international project. Contact: aquila entertainment c/o Bugs and Bytes LLC afilmnmusicbiz@gmail.com www.bugsnbytesllc.com for submission. Deadline for inquiries & submissions is Wednesday, October 5th by 6pm EST.